Our first 'vacation' in a long time took Jill and I to the Caribbean aboard Royal Caribbean's "Freedom of the Seas", the largest cruise ship in the world! All told, the ship could hold 4,000 passengers. 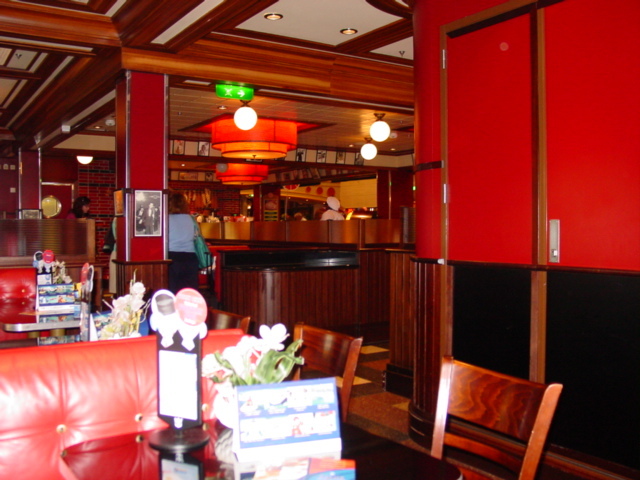 It featured a large auditorium, an ice rink, a three story dining room, as well as Johnny Rockets, Chops, Portofino's, three separate pools, and a spa and gym (complete with boxing ring). 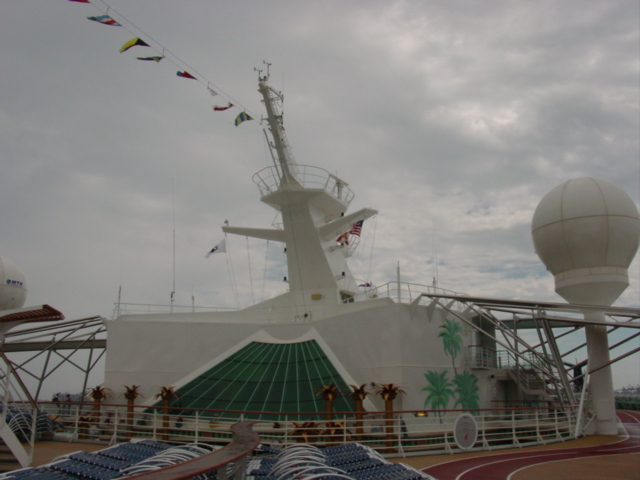 Jill booked a room on the tenth deck (cabin 1588), which was a deluxe room with balcony. On our deck were most of the LARGE suites as well, which worked out pretty well for us with our luggage being some of the first delivered! We set out from Binghamton around 9:00 at night. I had worked the day and had someone come in for me at 8:00, hence the delay/lateness in us getting on the road. We wanted to get to Rochester at a reasonable hour, so we stopped quick at Brozetti's for an 8-cut pizza and off we went! Jill made reservations at the Mariott Rochester Airport for this trip. It got good reviews, and it had a free shuttle from the hotel to the airport, and we could keep the car at the hotel! Saved us some money by not having to pay to park at the airport for the next week. We got in there around 11:30 or so, and crashed out for the night. Reveille was bright and early for us - 5:15! Oye! Our shuttle to the airport was leaving at 6:00, so we needed to be up and out early. We hopped the shuttle, and were at the airport by 6:20 or so. We didn't have any problems checking in for our flight (thank goodness! ), so we headed through security and upstairs. Grabbed some breakfast quick at a stand up there - bagels for both of us - and then found our way to the gate. Our flight was on Delta, and we flew from Rochester to Atlanta (my most not favorite airport in the world so far! ), and from there it was on to Fort Lauderdale. After landing in Fort Lauderdale and procuring all of our luggage (no more calypso music when the luggage belt starts up there - what up with that??) we rented a car from Dollar Rent-A-Car and headed south towards Miami. Along the way, we stopped in Hollywood, Florida and made our way to CVS - looking for 'Chaser', a hangover remedy/preventer. We weren't successful in finding it, but we did find some Diet Coke and Sangria, so we bought those instead. 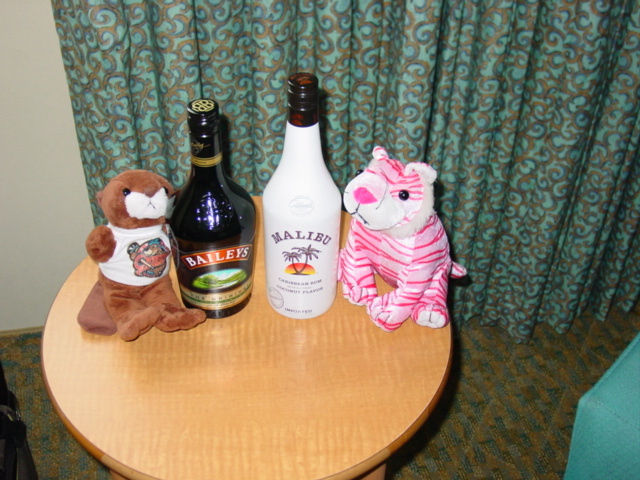 Then we went next door to Hollywood Wine and Liquor, where we bought some coconut rum and Bailey's Irish Creme. 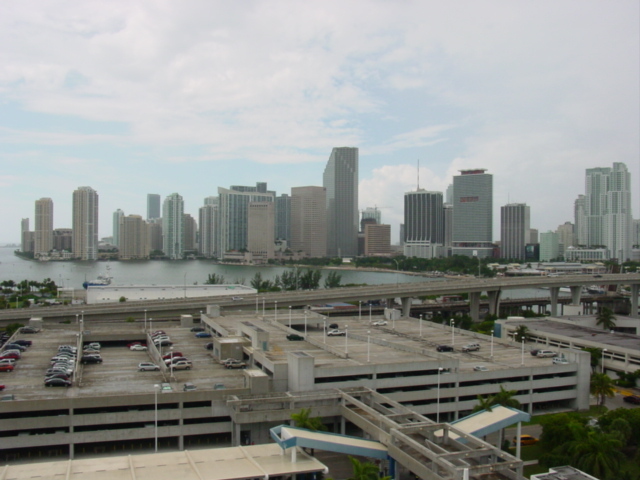 We continued on from there to our hotel in Miami, the Hampton Inn-Miami Airport. Another high ranked find by Jill from TripAdvisor! It was a great hotel in a good location for us. After checking in and getting settled, we made our way to Miami Beach for dinner and some sightseeing. 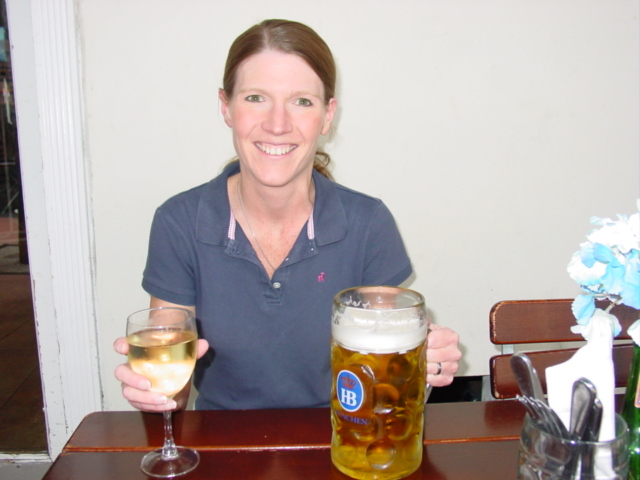 We already knew where we were going for dinner LONG before we got there - the Hofbrauhaus Miami Beach! We've been to the one in Vegas, a couple of times now, so we knew we had to visit this location! It was a bit different than the Vegas location, but the food and drinks were just as good! The Hofbrauhaus Miami is located along the Lincoln Road Mall. For an appetizer we had the Obazter, and for dinner, Jill had a grilled chicken sandwich and a couple of Rieslings, and I had the sauerbraten along with a litre of Hofbrauhaus beer! This was an walking mall with lots of shops up and down the way, so after dinner we tried to walk off our meals (and drinks) a bit by browsing through the stores. When we had exhausted that, we moved the car closer to the actual beach and from there did some more walking in and out of the stores. Along the way, we found a Fat Tuesday! Never ones to pass up the opportunity for a frozen mudslide, we each enjoyed one before continuing on our way. We actually did some shopping and buying in both Urban Outfitters and Sephora, before going back to the car and driving back to the hotel for the night. The guys with the weeks stash! 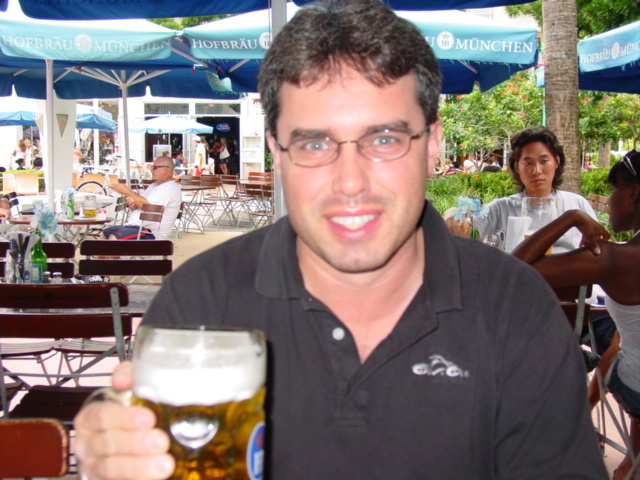 Tim with his litre of beer! Jill double fistin' the booze! We woke up on Sunday morning and had breakfast at the hotel. 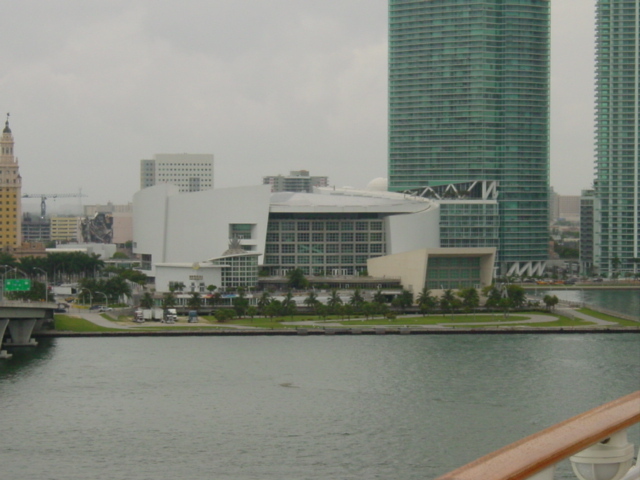 From there, we took the car back to the rental return and took a shuttle bus to the Miami Airport. The next leg of our trip was via taxi from the airport to the cruise terminal (yeah!!). We dropped off our baggage with the porters, and went through the boarding process. 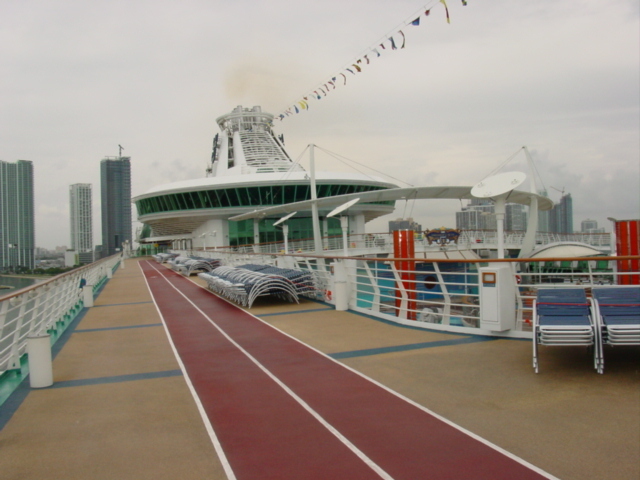 When all was said and done, we were onboard Freedom of the Seas by 11:30 - more than enough time to explore the ship! Our first stop? The Upper Bar by the pool - the perfect place to grab our first drinks on the boat and check out the view of downtown Miami. We wandered around the ship a bit more (and grabbed a couple more beers), and then decided it was time to get some lunch. The Windjammer was open for lunch, but we wanted to try and avoid the crowd (seems like EVERYONE heads to the Windjammer when they come on the ship), so we made our way to the Royal Promenade and found Sorrento's, the pizza joint on Freedom. Jill had a piece of plain and a piece of veggie pizza, and I had two pieces of chorizo...and we grabbed a couple more beers. By now, it was after 1:00, the appointed time we could go to our state room, so off we went! We were on Deck 10, Room #1588. Great location, and a great view off of our balcony as well! Jill has definately turned me into a balcony snob between this cruise and the last one! 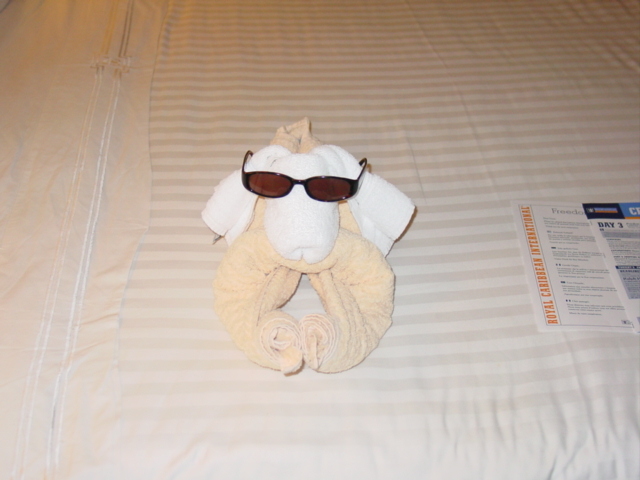 Our luggage still hadn't arrived to the room, so we went back out to wander around the ship. Actually, as we were headed out, we noticed our luggage in the service hallway. We went to the bar near the 'adult' pool and had a couple more beers each (just to give the stewards enough time to deliver our luggage of course! 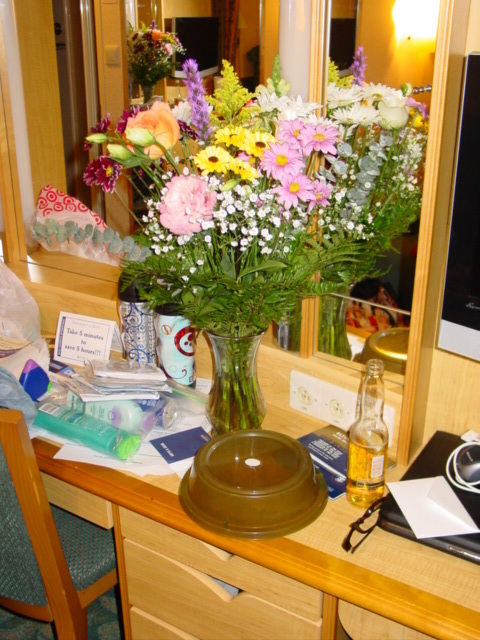 ), before heading back to the room. When we arrived at the room, we had all of our bags - but one! Ut oh! Luckily, we saw it still sitting in the service hallway, so we just snagged it - they were a bit slow on Freedom at getting the luggage distributed. We unpacked our bags, and took a bit of time to get the room in order before heading back out again. We found ourselves on the Grand Promenade at this point, so we stopped at the Bull & Bear for a beer and Strongbow, and then across to Sorrento's for a snack (salads with some fixin's for both of us). We headed back to the room to get changed for the evening, and then to Bolero's for a couple of mojito's (getting into full cruise mode there!). We went to the showroom for the early show (since we were eating later), where we saw our cruise director for the first time - Richard Spacey - probably the best cruise director on the high seas! What followed was a show with some pretty cool acrobats and another really funny comedian. Dinner was next - we did keep moving didn't we? 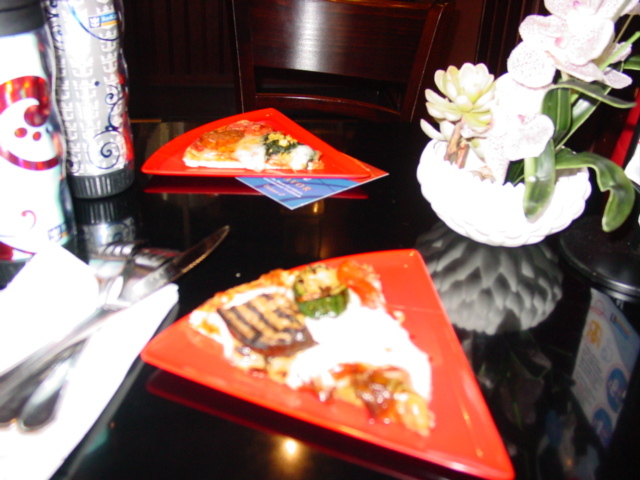 - We had a table for two (#369 to be exact), which was nice since we really didn't feel like socializing with anyone else. Our waiter was Jomas, and he was from Tunisia. 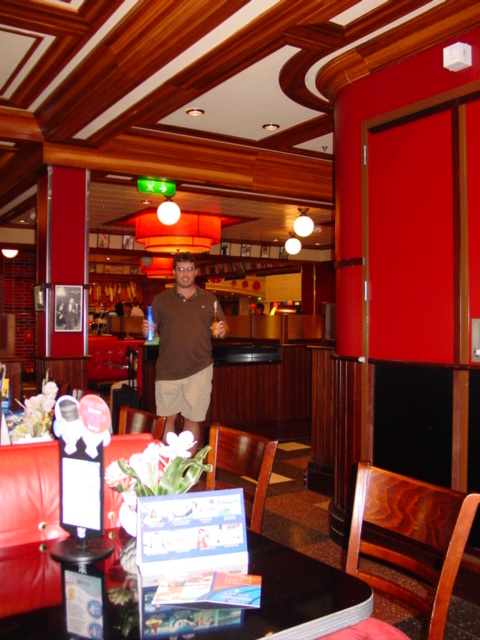 He proved to be probably the best waiter we had on any of the cruises we took or have taken. At the end of dinner, actually, we sat and talked to him for quite a while. For dinner our first night, Jill had tortilla soup for an appetizer, and salmon for dinner, followed by strawberry merainge for dessert; I had hot and sour shrimp soup as an appetizer, pork medallions for the main course, and chocolate cherry cake for dessert. We used one of our wine bottles from our romance package for dinner, settling on a nice Riesling. After dinner, we stopped at the room quick for some Advil (for Tim), and then went to the Crypt where we danced the night away until after midnight, when we went back to the room and crashed! Look, here comes Tim with more beer! 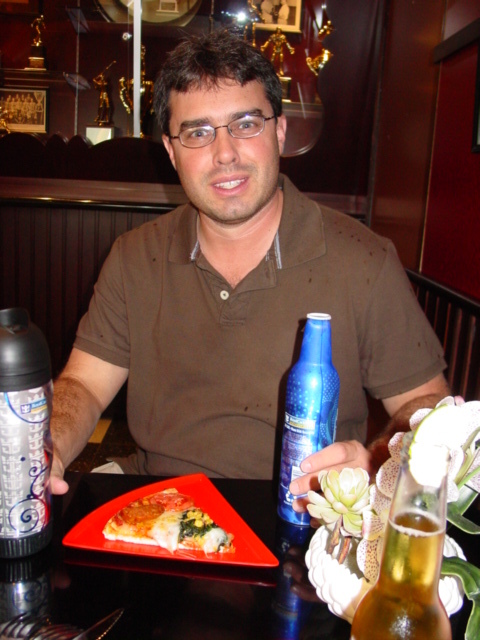 A pizza, a beer, on a cruiseship with his honey - now that's one happy man! 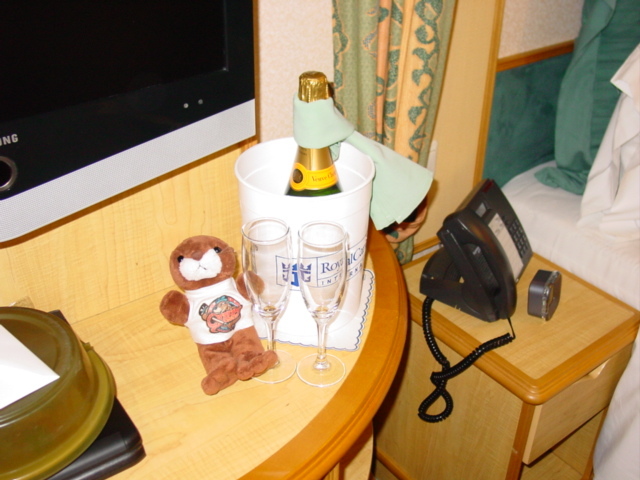 Otter guarding the sail away champagne! 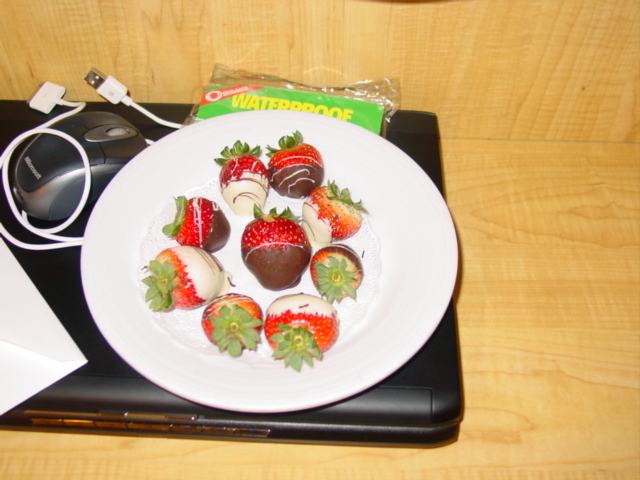 Jill got us a very nice assortment of chocolate covered strawberries too! Monday was a 'day at sea', so we took that opportunity to sleep in a bit! When we got up, around 9:30 or so, we went to a 'Meet and Mingle' that was held for the folks from Cruise Critic, a message board on the internet. After hangin' there for a bit, and getting some free goodies, we ran down and grabbed tickets for the ice show, and then hit the Windjammer for a quick breakfast. We stopped back in the room and changed into our bathing suits, in hopes of taking advantage of the sun and a lounge chair! 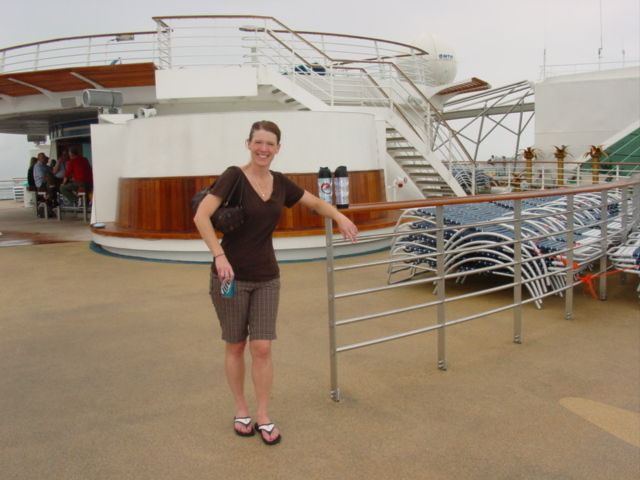 Our first stop was the top deck of the ship, but we soon found that to be way to windy, so we tried, to no avail, to find somewhere on the pool deck (at sea days are terrible for a poolside lounge chair!). At this point, we just grabbed a couple drinks at the one pool bar (diet coke for Jill, a Corona for me) and went back to the room to lay down for a bit. After a quick power nap, we headed back to the Windjammer for a snack, and then back to the pool deck in another attempt to find somewhere to lounge. This time, we decided to hit the hot tub instead (since there was more room in there than there was to lay out somewhere!). This went well, nice and relaxing, until a drunk guy passed out, in the tub, and others in the tub had to keep holding him up so he didn't go under the water! It was about now that we decided to leave the hot tub and try out the pool (which ended up being way to cold). We found a spot in the other hot tub, across the deck from the first one, and this gave us a good vantage point to watch the happenings in the first one. By now, ships security and medics had shown up to assist the young, drunk man, but he didn't want help, so instead he was escorted off to points unknown on the ship by the security staff. 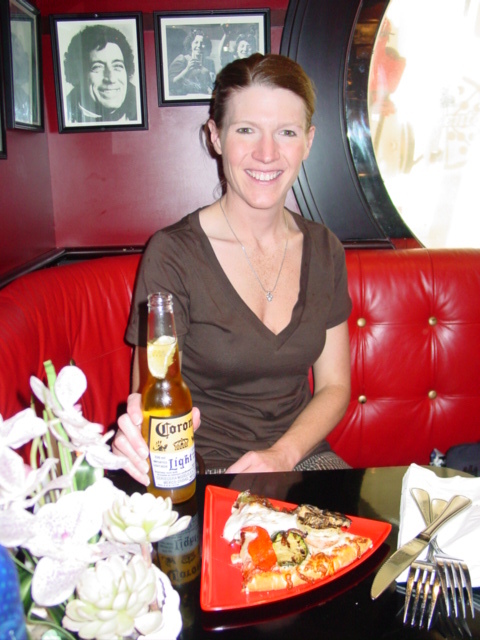 We actually found somewhere to sit at this point, and I grabbed another Corona, and a water for Jill. Tonight was our first, of two, reservations at the specialty restaurants onboard Freedom. Chops, a 'steakhouse', was our first reservation of the week. After changing into our formal wear, we went down to the promenade and had some pictures taken (snaggin' a couple glasses of champagne along the way), and then went to the Pharoh's Room for the Captains reception (and a couple more champagne's). Then it was time for dinner. Chops was a very nice space, and was definately laid out as a fine dining restaurant - much different atmosphere than even the main dining room. For dinner, Jill had onion and cheese soup (appetizer), and halibut with a side of homefries; I had a lobster bisque (appetizer), and filet mignon with a side of sauteed mushrooms. We had our second bottle of Chateau St. Michel Riesling with this dinner as well. For dessert, I had a mochaccino and cheese brule, and Jill had a mudslide cake (which we took with us). Being that we were utterly exhauste after dinner, we went back to the room to crash out, where we found profiteroles and dessert as well! 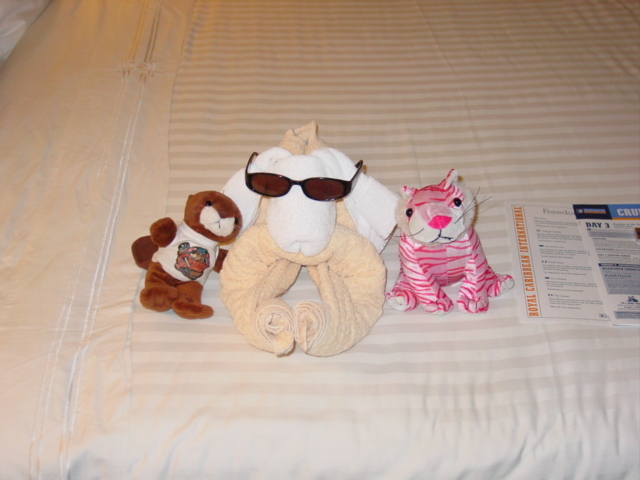 The guys with the towel rabbit! As I sit here updating the design of this webpage on August 8, 2014, I find that the rest of the narrative for the trip doesn't exist. More than likely that was in part to the fact that we were on vacation and decided to just have a great time! We'll pick up on Sunday where the narrative also picks up once again. When all was said and done, and we finally arrived back in Rochester on the 5th of October, we decided we would rather not attempt to make the drive back to Binghamton. So, we shacked up at what used to be (read: USED TO BE) our favorite Rochester area hotel - the Comfort Suites of Rochester on Hylan Drive. It was quite disappointing for us when we checked into the room though and saw how much the folks there had allowed this place to go downhill. What was once a 'given' for us to stay at in Rochester was now just a fond memory replaced by the wear and tear of time. We had breakfast the next day at the Breuger's Bagel nearby before heading back to Binghamton. The first leg of the outbound trip was aboard Delta flight 4869, ROC-->ATL, depart 7:45AM, arrive 10:08AM; Seats 19A and 19B. The second leg of the outbound trip was aboard Delta flight 861, ATL-->FLL, depart 1:00PM, arrive 2:44PM; Seats 31B and 31C. The first leg of the return trip was aboard Delta flight 1220, FLL-->CVG, depart 1:00PM, arrive 3:45PM; Seats 13D and 13E. The second leg of the return trip was aboard Delta flight 5100, CVG-->ROC, depart 7:35PM, arrive 9:07PM; Seats 3C and 3D.